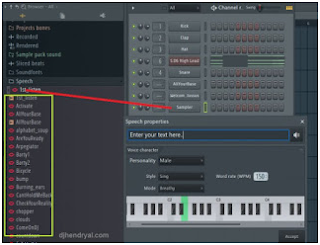 There is a missing plug in inside the plug in database on FL Studio 12 which is Speech Sythesizer. This plug in help us to convert text we write to be a voice. After i looking around, finally i get it. Its not inside the VST plug in list on FL Studio 11 but this text to speech plug in include on FL Studio 12 place under the file browser on the Folder Speech. Click it to open more preset of speech synthesizer. To change text to speech using speech sythesizer is so easy, this is step by step how to use it. 1. Drag one of the speech sythesizer preset into pattern or channel rack and type whatever text you want to convert to voice. The interface of speech dialogue on FL Studio 12 little bit different than previous version of FL Studio which is on the vocal picker. It simplify by click on note board to choose the note or to change the pitch. 2. Or you can right click on one of the speech sythesizer preset – add channel dan change the default text. Because on FL Studio 12 this plug in does not have standalone version of it do we need to use the available preset. We can set the words we write and have a different pitch by added number in parenthesis. 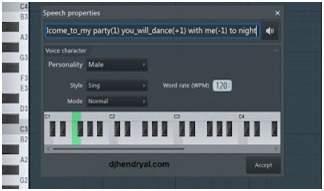 Ex: Welcome…to my party(1), this mean the party part will raise 1 pitch note if the note base from “C” it will change to “D” and so on…. welcome_to_my party(1) you_will_dance(+1) with me(-1) to night. The formula: if we want to raise the pitch one note add (1), if we want to lower the pitch add (-) before the number. If we want to make the voice a little bit longer add (+) follow by number. If we want to make it natural voice just add underscore between words (word interval). 3. Click on Accept button if you satisfied by the result and save it. After we save it, the text will turn to audio samples. We can make a unique voice such as robot, chipmunk and many others. Practice it on FL Studio 12. However text to speech plug in voice can not change the natural of human voice. If you want to get the best result and make custom voice, use your mic to record your own voice. Add that record to FL Studio and you can edit it and shape it to your needs. But if you just want to make a simple DJ name voice use robot voice it does not matter if you use speech synthesizer. Thank you, this helped me.